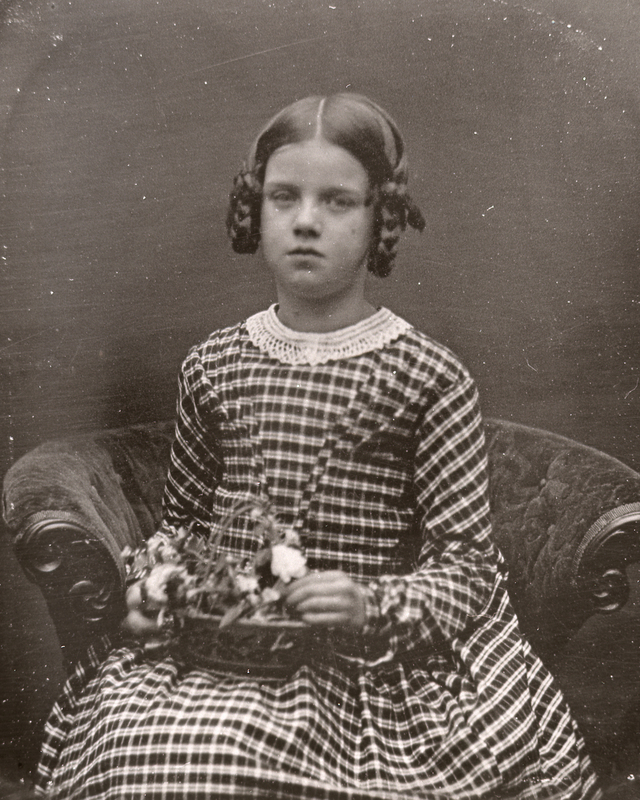 Charles and Emma Darwin’s eldest daughter, Annie, died at the age of ten in 1851. Emma was heavily pregnant with their fifth son, Horace, at the time and could not go with Charles when he took Annie to Malvern to consult the hydrotherapist, Dr Gully. Darwin wrote a memorial of his daughter just one week after her death. Annie's younger sister, Henrietta, recorded her own reactions in a poignant set of notes, which Emma Darwin kept. Links to a longer selection of letters relating to Annie's death and illness follow the transcriptions. The other point in her character, which made her joyousness & spirits so delightful, was her strong affection, which was of a most clinging, fondling nature. When quite a Baby, this showed itself in never being easy without touching Emma, when in bed with her, & quite lately she would when poorly fondle for any length of time one of Emma’s arms. When very unwell, Emma lying down beside her, seemed to soothe her in a manner quite different from what it would have done to any of our other children. So again, she would at almost anytime spend half-an-hour in arranging my hair, “making it” as she called it “beautiful”, or in smoothing, the poor dear darling, my collar or cuffs, in short in fondling me. She liked being kissed; indeed every expression in her countenance beamed with affection & kindness, & all her habits were influenced by her loving disposition. Besides her joyousness thus tempered, she was in her manners remarkably cordial, frank, open, straightforward natural5 and without any shade of reserve. Her whole mind was pure & transparent. One felt one knew her thoroughily & could trust her: I always thought, that come what might, we should have had in our old age, at least one loving soul, which nothing could have changed. She was generous, handsome & unsuspicious in all her conduct; free from envy & jealousy; goodtempered & never passionate. Hence she was very popular in the whole household, and strangers liked her & soon appreciated her. The very manner in which she shook hands with acquaintances showed her cordiality. Her figure & appearance were clearly influenced by her character: her eyes sparkled brightly; she often smiled; her step was elastic & firm; she held herself upright, & often threw her head a little backwards, as if she defied the world in her joyousness. For her age she was very tall, not thin & strong. Her hair was a nice brown & long; her complexion slightly brown; eyes, dark grey; her teeth large & white. The Daguerrotype is very like her, but fails entirely in expression: having been made two years since, her face had become lengthened & better looking. All her movements were vigorous, active & usually graceful: when going round the sand-walk with me, although I walked fast, yet she often used to go before pirouetting in the most elegant way, her dear face bright all the time, with the sweetest smiles. Occasionally she had a pretty coquettish manner towards me; the memory of which is charming: she often used exaggerated language, & when I quizzed her by exaggerating what she had said, how clearly can I now see the little toss of the head & exclamation of “Oh Papa what a shame of you”.— She had a truly feminine interest in dress, & was always neat: such undisguised satisfaction, escaping somehow all tinge of conceit & vanity, beamed from her face, when she had got hold of some ribbon or gay handkerchief of her Mamma’s.— One day she dressed herself up in a silk gown, cap, shawl & gloves of Emma, appearing in figure like a little old woman, but with her heightened colour, sparkling eyes & bridled smiles, she looked, as I thought, quite charming. Her health failed in a slight degree for about nine months before her last illness; but it only occasionally gave her a day of discomfort: at such times, she was never in the least degree8cross, peevish or impatient; & it was wonderful to see, as the discomfort passed, how quickly her elastic spirits brought back her joyousness & happiness. In the last short illness, her conduct in simple truth was angelic; she never once complained; never became fretful; was ever considerate of others; & was thankful in the most gentle, pathetic manner for everything done for her. When so exhausted that she could hardly speak, she praised everything that was given her, & said some tea “was beautifully good.” When I gave her some water, she said “I quite thank you”; & these, I believe were the last precious words ever addressed by her dear lips to me. 3 ‘buoyant’: ‘o’ over ‘y. 6 Elizabeth Darwin was six years younger than Anne. 7 Syme 1821, now in the Darwin Library—CUL. She burst into tears when I asked her if she had been thinking about Annie, but said she had not. E. Mamma what can I do to be a good girl? E. Shall I pray to God now? She then said a little prayer after me. Aug. 24. At bed time. E. Will you help me to be good? E. I am afraid of going to hell. I told her I thought Annie was safe in Heaven. M. Come to me & I will try to help you as much as I can. E. But you are always with somebody. E. (whispering) do you think I have done any thing wrong today. We consulted a little over her prayers. I repeated “Suffer little children” &c It did not seem to be Pilgrims Progress as I had suspected which had alarmed her. E. Do you think you shall come to Heaven with me? E. And Georgy too I hope. The next day she seemed trying to be good all day, & ended at night looking very sweet & happy. & I hope her fears are passed. Feb. 1852. E’s mind seems to have developed itself wonderfully in the last few months. She asked me to put some of Annie’s hair in her locket. Last night. Mamma when I see any thing belonging to Annie it makes me think of her. Sometimes I make believe (but I know it is not true) that she is not quite dead, but will come back again sometime. Some time ago she cried in great distress & said Mamma I used to be a very naughty girl when Annie was alive do you think God will forgive me. I used to be very unkind to Annie. Last night “Mamma I want you to put something in my prayers about not being proud, as well as not being selfish. Reports the state of Anne Darwin’s health. Asks EAD to forward a message of Anne’s improved state to Down. Detailed account of progress of Anne’s illness. Is hopeful about Anne after receiving an encouraging message. Reports on Anne’s health throughout the night and from 8 a.m. through to 4.30 p.m.
Asks FW to come over to feel his daughter’s pulse. Tells CD how Anne’s death is affecting Emma. Hopes he may soon return. Her reactions to Anne’s death; hopes CD may soon return. Commiseration on the death of Anne. His favourite child, Anne, has unexpectedly died. The edited transcriptions were first published in The correspondence of Charles Darwin, vol. 4, Appendix II. The original manuscript of Darwin's memorial is in the Darwin Archive of Cambridge University Library (DAR 210.13); the was also published in Ralph Colp, Jr., 'Charles Darwin’s ‘insufferable grief', Free Associations 9: 7–44. The transcription of Henrietta Darwin's reaction was prepared, with the kind permission of Richard Darwin Keynes, from notes made by Emma Darwin in the months following Anne Darwin’s death. In the dialogue, 'E' is Henrietta (Etty) and 'M' her mother Emma.